The SE R1s have been around for a little while. They came out at a similar time to the Sontronics Sigmas and together they present a more affordable option to studios wanting the ribbon sound in their armoury. The Sigmas are pretty good, I used them on several projects a year or more ago. But now my current studio, Silver Street Studios have invested in the SE R1s so I thought I’d give them a quick test run for the blog. 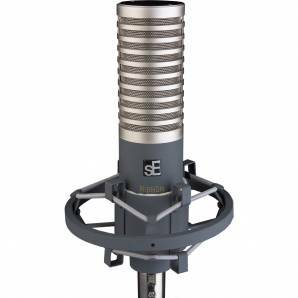 SE make two Ribbon microphones, the R1 (now VR1) and the RNR1, The RNR1 is designed by Rupert Neve, costs around £1000 and represented SE’s ambition to move on from budget microphone manufacturer to a serious player in the field. It’s been some time since that move was made and I’m beginning to feel more and more like it was a great success. The hope is that the SE have taken what they learn’t in manufacturing the RNR1s and used it in the cheaper R1s. Still not too cheap, the original RRP for one was about £500. But now thanks to SE’s new VR1, the R1 can be picked up at a fantastic price. 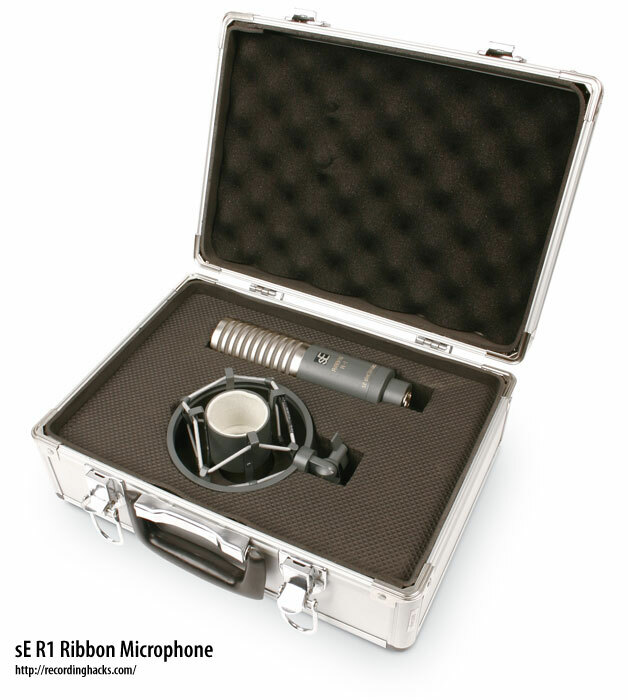 The R1 is presented in a rock-steady flight case with reinforced corners and metal hinges and catches. It’s so easy for microphone companies to overlook the importance of a good box (yes, I’m looking at you EV and your RE20)! The SE box here would protect the microphone through the nuclear apocalypse as well as stacking well in storage and providing strong handles for carrying. Little things, I know, but, for me at least, it all adds up! The cradle is also superbly crafted. It’s a snug fit and the mic locks in using a bolt around it’s XLR jack that when screwed up appears to be part of the design seamlessly. The elastic is quite ridged and hooked in well. The moveable joints are also firm. This all means that the cradle is very strong and keeps the mic where you want it without flopping. Test 1 is a recording of a pair of Rode NT5s, set up as a coincident X-Y pair directly above the kit. The NT5s are a good example of standard small diaphragm condensers. They are cardioid and produce a tight, close overhead recording. They work well as a control for our experiments. The R1s where placed as a Blumlein pair as close as possible to the NT5s. Test 2 is the raw mic capture. You can immediately here the classic ribbon roll off above 5-10kHz. There is a strong prominence of snare and the kick drum is clearer than that of the NT5s. The R1s sound warm, analogue and they have more ambiance. The live room at Silver Street Studios has hard wood and stone flooring and creates a lively space that can clearly be heard throught the R1s. Next I added a high shelf EQ of 5dB above 8k (Test 3) using a Waves Renaissance EQ. I did this to bring back some of the highs lost by using the Ribbons. You’ll notice that rather than creating a more typical condenser sound when you boost the highs on these ribbon microphones there is a space and liveliness that brings back the shimmer to the cymbals and keeps weight in the drums. The drums seem well balanced in this recording and I would say that with a bit of compression we’d almost have a complete drum sound from our overheads. So that’s what I did in Test 4. Be warned the average level is higher on this clip so you might wish to adjust your master volume. We also tested the R1s on an electric guitar and vocals. On guitar the roll off softened an aggressive tone and worked well on less gainy amp settings. It sounded very affected close mic’d and more realistic but ambient at a distance. On vocals the Ribbons were lovely! Especially once a high shelf was applied. The recording was smooth, warm and analogue sounding. Potentially harsh peaks seemed to be rounded over and the mic coped well with dynamic changes. I am so pleased to have these in our armoury at Silver Street. They are fantastic. I don’t think I’ll rush to them for electric guitar, but they will be sure favourites for an awful lot! They’ll obviously suit certain genres better than others. They should work well on vocals in nearly any mix and for a natural sounding recording with acoustic space and warmth these will be my new number ones. By Graeme Rawson, with help during testing from Chris Morrow. Yesterday I ranted about the dumbing down of mixing. 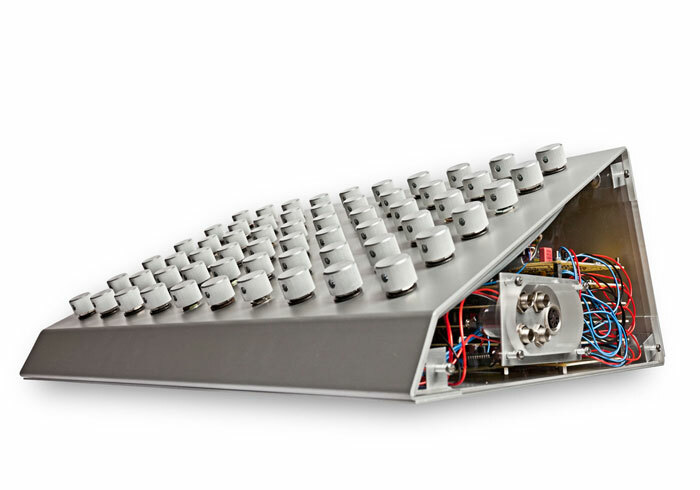 Today I hope to provide a more balanced view on the new One Knob series from Waves. Whilst writing my post yesterday I had the idea to do a One Knob mix to see how versatile these plug ins can be. The One Knob mix took about 35 minutes to do. Here’s a quick outline of what was used where and roughly how much the dial was turned to in brackets. So as you can see I used all the plug ins and tried to do what I would normally do in a mix. The first weakness I’d like to address is that Wetter is designed to work as an Insert, not as a send, meaning I had to drop loads in on the session. By dialling up Wetter you’re not only increasing the mix of the reverb but the size and length of it too. So in my mix, where I have several different reverb settings it has become a mess. Pressure is much better used as a bus compressor, it really didn’t work on the close microphones on the drums. At lower settings the compression is quite subtle but it soon gets out of hand and when I dialed the master bus Pressure up to 10 something very strange happened… I actually felt physically sick! It was the same kind of weird sickness I get when I hear serious phase problems. I had to dial it down pronto. Phatter makes things bassier… not much to say there. I think it might do some low end compression too. Not sure so I won’t guarantee that. Brighter is a really nice clean and transparent high boost. But I recommend getting a good parametric EQ and using that. Filter is really for use on Dance tracks. Like Brighter and Phatter it does sound nice, but it does nothing that many other quality filters and EQs do already. I’d also like to point out that Filter has a resonance selection button! I wanted One Knob, not One Knob And A Button. Driver. This is the one I liked the most. The very low settings worked nicely as a lo-fi effect. Higher gains were pretty good a boost to guitars but it’s not good enough to be the whole guitar tone. Louder is the ultimate nemesis of Dynamic Range Day, Turn It Up.org and friends. It’s a limiter that sounded like it was limiting very quickly and didn’t actually stop my master output from clipping anyway… so… why? So in conclusion; I don’t get it. I don’t think you can deny the quality behind each one of these little things, individually they sound good. But with multiple instances of these plug ins they seem to clash with themselves, especially Wetter. So as a one off effect for one channel in your mix, a couple of these plug ins would work well. Namely Driver and Filter. The EQ two Phatter and Brighter are really nice, but if you own any good parametric EQ plug ins already they’re pointless. I would seriously stay away from the compression ones and I can’t see the use in a one-trick reverb.